Sizing: and the design of the architecture that follows is the first important phase of any project. A step in the wrong direction will likely derail the project. The topic sounds technical right? Actually, sizing involves as much of the business as the IT team. According to SAP, sizing involves 'Translating business requirements into hardware requirements - in an iterative process.' 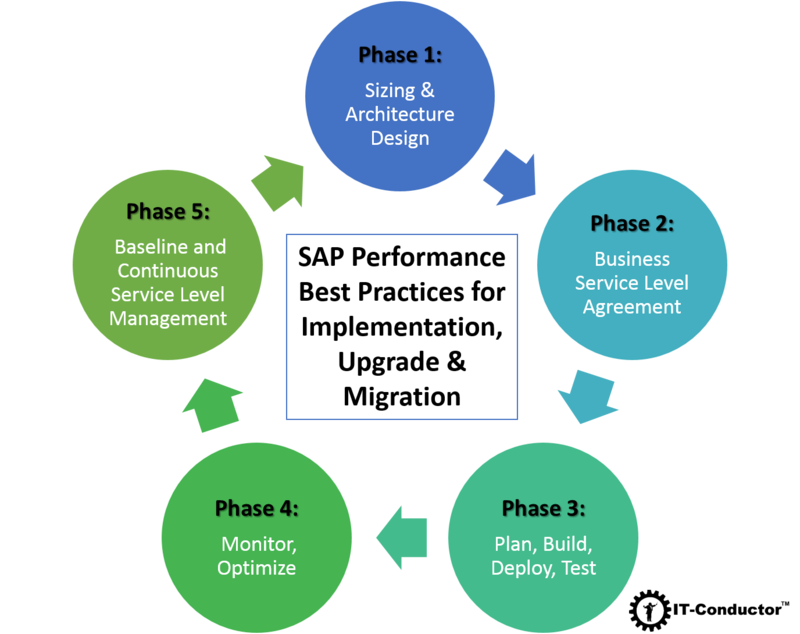 Gartner in its June 2014 article (Follow Three Best Practices to Optimize SAP Business Suite Application Performance) recommended to 'Perform annual capacity planning for each SAP Business Suite application to ensure sufficient hardware headroom through its life cycle'. Architecture Design: Once the sizing information has been generated as standard SAPS, the customer can submit those to their platform vendor (which may now also include cloud providers). The vendor architect will map those requirements to CPU, Memory, Disk Size, I/O throughput, and Network load. Based on those requirements, platform specific hardware or virtualized infrastructure options are proposed. Customers to shop several partners for options, assess pros and cons, and if possible perform a proof-of-concept (PoC) on those options. In earlier SAP days, POC can be costly with leased hardware and services which may get credited by the vendor towards a purchase (if made). Nowadays, with cloud PaaS (Platform as a Service) and IaaS (Infrastructure as a Service), it's definitely less costly to trial before your buy. Sizing is part art, part science so make it iterative and review often as earlier assumptions become fact or validated as part of PoC or testing. Requirements also may change over time so just expect them and iterate accordingly. Of course, the more complex the business scenarios, the more iterations may be needed to address various application needs. Business Service Level Agreement (SLA) are ways of measuring the quality of service that IT provides to the business units or end-user groups of the application. Sometimes they may be referred to internally in IT as Operational Level Agreement (OLA), which governs how the IT environment should operate to provide shared services to end-users. Before building, testing and delivering any service, IT organization should establish templates and metrics for which the Business can agree with as the baseline for service quality. These items will become KPI (Key Performance Indicator) which are measured, reported for compliance on a periodic basis. IT and Business (or Line of Business - LOB) should agree during this phase to mock-up dashboards which would measure, report, notify and pre-assemble remediation processes to deal with SLA violations, including service desk queues and team assignments to deal with availability and performance issues or incidents. Plan: the work and work the plan! Now that there are clear sizing, architecture and SLA established, it's time to map out the tasks required to accomplish the delivery of a functional and efficient application environment. Depending on the size of the project, executive sponsorship must exist to create a project plan that includes availability and performance related tasks in every step. Deploy: isn't it the same as Build? It can be if you're building only one system, often it's not the case with SAP. Unless your environment is a single-system landscape, many customers will build development, QA, test/staging, DR and Production. Sometimes a Production environment is built initially as a learning exercise for early testing, but deployed again with various optimization or automation, especially in virtualized settings or software-defined datacenter such as VMware. Test: validates the build and deployment to ensure it performs as expected in the areas of availability and performance. The more testing with objectives the better the operational readiness the team and environment. Optimize: can be at the infrastructure level (OS, DB, Storage, Network), application configuration, and custom code. Apply specific tuning recommendations from each vendor for the technology deployed. Poorly optimized code can be mistaken as performance issues at the infrastructure level, so application code analysis along with SQL analysis are typically the next level of optimization once monitoring has identified them as top consumers. Code inspectors can be used to identify poorly formed code which may appear fine when run against small volume but grinds against large volume of data. Baseline: involves the performance measurement at key times to capture what to expect under certain workload, such as load tests, benchmarks and other cycles like daily, weekly, monthly, quarterly, annually. Pre-golive tests and measurements should provide estimates of what to expect after going productive on the new environment. After go-live, the actual production workload at those cycles like month-end or some key peak workload times should be captured for comparisons and analysis. Continuous SLM: Performance is dynamic and constantly changing based on business usage patterns and data volume over time, so continuous vigilance in monitoring, analysis and optimizing is required to ensure capacity and configuration continues to meet demands. 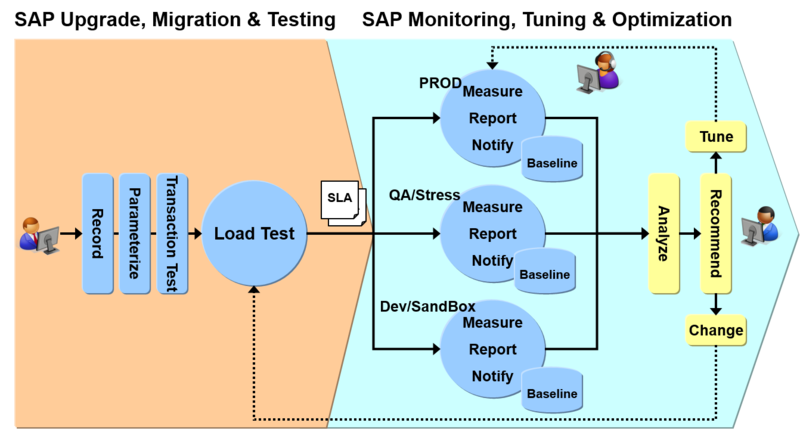 Service Impact Management monitoring tool is important to relate whether infrastructure or application issues actually have impacts on overall SLA so that appropriate priorities can be assigned to managing those exceptions. Otherwise, there would be too many unprioritized items fighting for the performance team's resources.